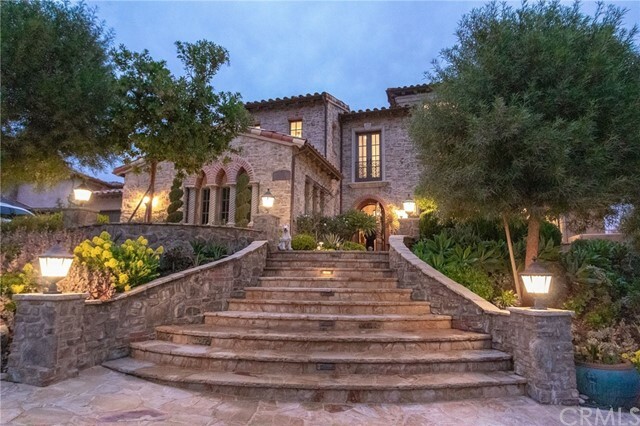 This custom-built, authentic Italian Tuscany-style home is located in a private neighborhood in Valencia. This house overlooks the fantastic panoramic view of Downtown Valencia. All the interior materials were meticulously handpicked from the ground work all the way to the rooftop, collaborating with a highly-skilled architect. The architect&apos;s sincerity and pride that he takes in his work can be found through his initials labeled in each cabinet. This home is unlike any other homes built by any construction company through minimum standards. Each piece such as the door, molding, fountain, and landscape, is created with fine details and finesse, showing the work of a truly, skilled artisan. It is a final product of a craftsman who made a trip to Europe just to perfect this masterpiece. The golf course adjacent to this home is a recognized sports facility that is used for PGA golf tournaments. Starting The backyard view of this home is a wide area of approximately 90 acres. It is truly a quiet, tranquil view with a luxury feel. This home has several boastful distinctive features. There is an indoor elevator that can be useful. All the kitchen appliances are upgraded to modern, top quality. The refrigerator and wine cooler cabinets are entirely custom-made. The small study area in the staircase can be efficiently utilized for additional. Every piece in this home including staircase, doors, moldings, and hallways is picked from the best designs and quality.